Summer May be Gone, But Your Need for an Awning Isn’t! Typically, homeowners will tell you that they most value their awning in the summertime. And this sentiment is entirely understandable; in the summer, the heat and harsh rays of the sun can be kept out of your house by an awning, and when spending time outdoors, your skin is protected by the awning’s shade. But just because summer has officially come to a close, this does not mean that you no longer have a need for an awning- in fact, most homeowners find that their awning serves a valuable role year-round! Read on to find out more about the benefits of having an awning for the fall season. The sun may not be shining its hottest in fall, but that does not change the effect its rays can have. Fall might be your favorite season to lounge on your porch or patio; the weather is neither too hot or too cold, and you can spend your time relaxing in the fresh air. But if the sun is still shining directly on you, even at lower temperatures it can end up damaging your skin. Sunburn can lead to premature wrinkling, age spots, and has been linked to causing skin cancer, so it is important that no matter what time of year it is, you take the necessary steps to shield your skin from the sun. An awning can provide you with the perfect area of shade to enjoy the outdoors without the risk of sun damage to your skin. Are you looking to have an awning installed this fall? 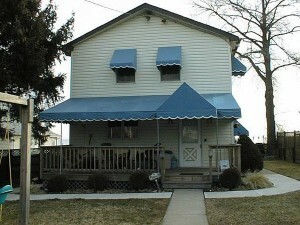 Call Carroll Awning today!